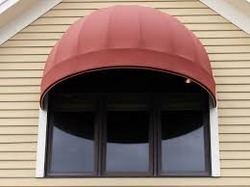 Awning : We are offering an exclusive collection of Round Window Awing that is available in diverse sizes and colors. Our offered awing is globally demanded for its stylish We are offering an exclusive collection of Round Window Awing that is available in diverse sizes and colors. Our offered awing is globally demanded for its stylish design and superior finish. The entire awing is beautifully designed and manufactured with utmost care by our vendor’s craftsmen using the finest quality raw material and latest technology. Our offered awing can be custom-designed, as per demands of our esteemed clients. We mainly deals in Delhi NCR. Buyer from all INDIA will be perefered with the bulk Quantity. Incepted in the year 2014, we Indian Shades are one of the emerging companies of the industry associated with supplying, exporting and importing a huge quality assured gamut of a wide variety of products which includes Awning Fabric, Terrace Awning, Window Awning and Window Blind. Within these offered categories, we are providing an excellent range of products which consists of Awning Fabric, Terrace Awning, Window Awning, Horizontal Window Blind, Roller Window Blind, Vertical Window Blind and Wooden Window Blind to our prestigious clients. We are sourcing these products from one of the most experienced, reliable, certified and authentic vendors of the industry in order to maintain the supreme quality standards of these products. Manufactured making use of high grade raw material and highly contemporary and modern machines and tools at our vendors’ premises, we are providing them to our customers after testing them on various quality factors. In addition to this, our customers are immensely recommending our products because of our offered reasonable prices and on time product deliveries.